The Apollo Hotel , run by the Borghetti Malvini family for 45 years, is located in Valverde di Cesenatico, in a green area just a few steps from the beach. Recently renovated and equipped for cyclists, dedicates many services to children and has a swimming pool, WI-FI and parking. Admits small and medium-sized pets. 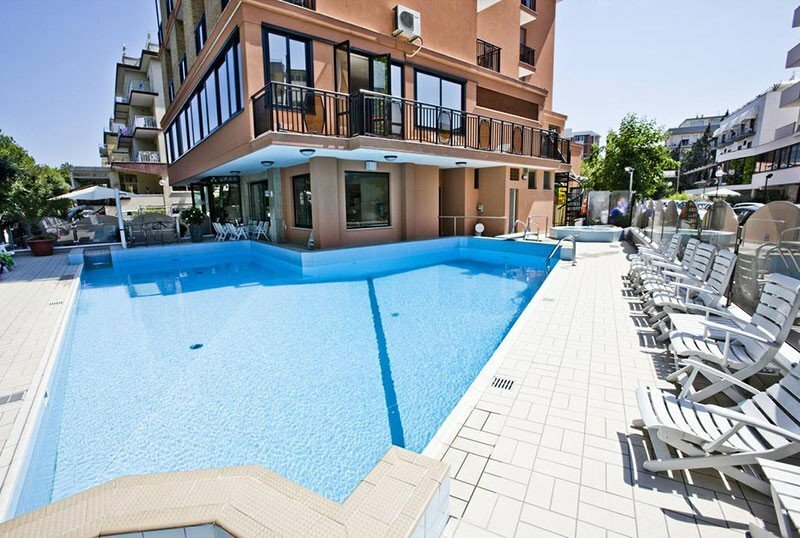 The hotel is located in Valverde di Cesenatico in a quiet area near the beach, a ten minute walk from the Levante Park. All rooms have a balcony (in some cases with sea view), air conditioning, WI-FI, satellite TV and digital terrestrial 22 ", telephone, safe and private bathroom with shower, toiletries and hairdryer. FAMILY: on request interconnecting rooms for groups and large families. Completely renovated, it has a swimming pool, jacuzzi, garden, sun terrace, gym, free use of bicycles, reading room with newspapers available, theme nights. Equipped for cyclists. On request: massages, beach towel for a fee. PARKING: discovered available for all customers. LUNCH AND DINNER: choice of menu with three first and three second courses of meat or fish. The kitchen serves traditional Romagna and national dishes followed by a buffet of vegetables and appetizers. VARIATIONS: upon request the kitchen prepares ad hoc menus for particular diets and sports. OTHER: free aperitifs are served every week and theme dinners are organized. In the hotel: outdoor playground area, bicycles with child seats, strollers. In the room: cots, cribs and baby baths. At meals: baby food , homogenized, flexible hours on request, ad hoc menu with pasta with tomato sauce, steaks and more on request, high chairs and bottle warmers. The hotel has a swimming pool with Jacuzzi, surrounded by a sunbathing area with loungers. Swimming lessons are organized for the little ones, while adults can find aquagym lessons. At the disposal of cyclists: personalized menus, rich buffet of pasta, vegetables and cakes from 14.30 to 16.30, equipped gym, hydromassage, garage, laundry service for sportswear, masseur, maps and itineraries of the hinterland. The prices of the price list are per person per day full board, for a stay min. of 3 days for the type Venere, min. 4 days for the Nettuto and Apollo typology. FORMULA APOLLO: Full board or half board + water, wine and drinks with meals + 2 sunbeds and a beach umbrella + beach towel + air conditioning + welcome fruit basket. Children are welcome: Up to 3 years free, from 4 to 12 years 50% discount. Like every year, the Borghetti-Malvini family awaits you at the Nove Colli with special offers for all bicycle enthusiasts. Weren't you able to sign up? Don't worry, we'll do it! Hotel package with breastplate included ! !